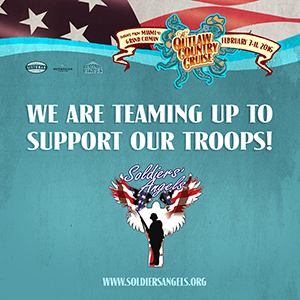 Soldiers' Angels teams up with Sixthman Festivals at Sea to support our troops for the second year! This time, Soldiers' Angels will be aboard "The Outlaw Country Cruise" in February 2016. The cruise will be sailing from Miami to Grand Cayman from February 7-11 and will feature a huge lineup of country musicians, such as: Blackberry Smoke, Lucinda Williams and over twenty other bands/musicians! During the cruise, there will be an auction for guitars signed by the bands. All proceeds from the auction will go to Soldiers' Angels!